Oh chickpeas, how I love thee. You are endlessly versatile, wildly nutritious, and totally charming (can a bean be charming? I think yes). Even before I became more intentional about reducing waste, I often went with dried beans instead of canned, because the difference in price is truly outrageous. Sure, it takes a bit more planning to cook dried beans, but you'll save cans on cans on cans (many of which are lined with BPA and thus super difficult to recycle) and also $$$ (or £££, in my case). This is my chickpea routine: soak up a load of dried beans for 8-24 hours, simmer + blend half for hummus, and blitz + bake half into falafel. I always make a big batch of both, which is great for entertaining or having on hand for lunches throughout the week. This is about a 2 hour undertaking, but I promise it's worth every second! As a vegan, both hummus and falafel are favorites in my diet, but store-bought versions are ALWAYS packaged in plastic, overpriced, and underwhelming. They also tend to be chock-full of processed ingredients and preservatives. These recipes are the results of tons of tinkering over the years, and I'm thrilled to share them with you. Oh oh oh! You'll need a food processor for this project. If you don't have a food processor and can't afford to invest in one, see if you can borrow one or find one secondhand. It's a great tool to have around for making pesto, cashew cream, pie crust, homemade nut butters...all kinds of low-waste wholesome goodies. First thing's first: preheat the oven to 400F (200C), because almost all the action will be happening in here. Drain and rinse the soaked chickpeas. Place roughly half in an oven-safe pot with a lid and cover generously with water. Pop these in the oven to simmer away. Alternatively, you can cook the beans on the stove, but doing them this way is nice and efficient as you're already using the oven. Set aside the other half of the soaked chickpeas. Boil a pot of water to cook the sweet potato. Chop your spud into small-ish chunks, add to the boiling water, and simmer for about 15 minutes or until soft. While the sweet potato is getting groovy on the stove, cut the onion into quarters and toss it into a food processor along with the garlic. Blitz until finely chopped. Add the reserved soaked (uncooked!) chickpeas to the food processor and blend everything up nice and fine, periodically stopping to scrape down the sides. 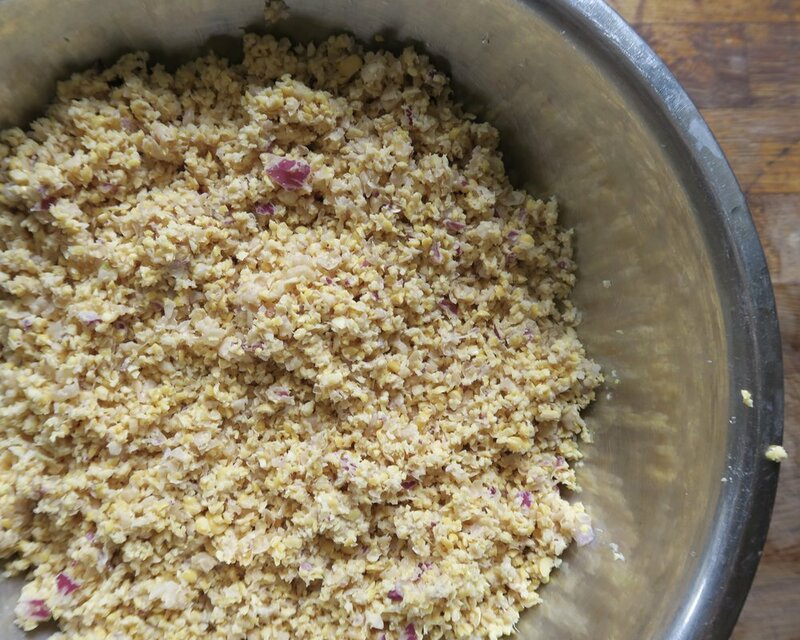 It can be helpful here to work in batches, if your food processor isn't having it. Transfer the mixture to a large bowl. 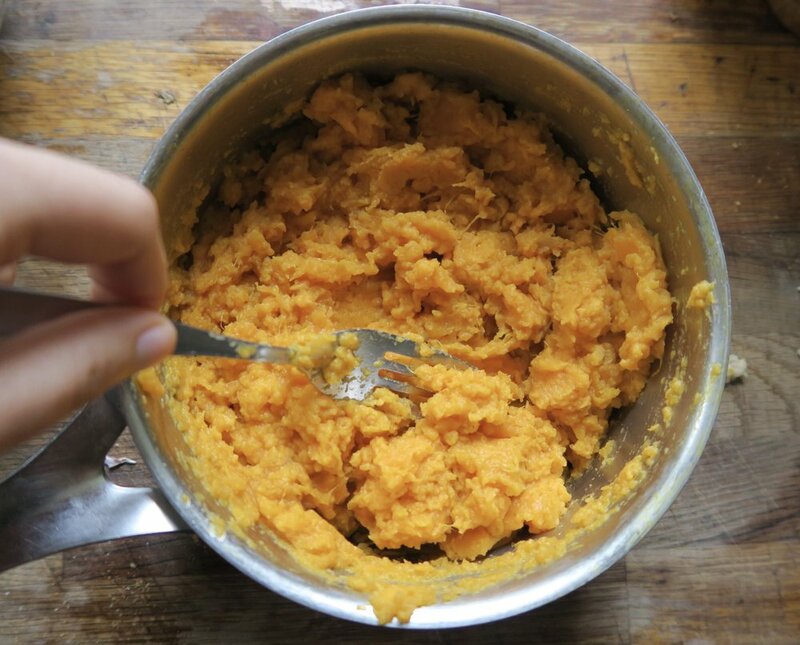 By this time, I'll bet your sweet potatoes are perfectly soft, so drain away the water and mash them with a fork. Add the mashed sweet potato, cumin, coriander, smoked paprika, olive oil, lemon juice, salt and pepper to the chickpea mixture. Taste it for seasoning and adjust to your liking. Grease a large cookie sheet with a drizzle of olive oil. Form the mixture into balls (roughly the size of golf balls) and place on the sheet pan. They don't spread out in the oven, so don't worry about leaving tons of space between them; I bake them in batches of 15. Pop them in the oven, and while you're in there say hi to your simmering pot of chickpeas. 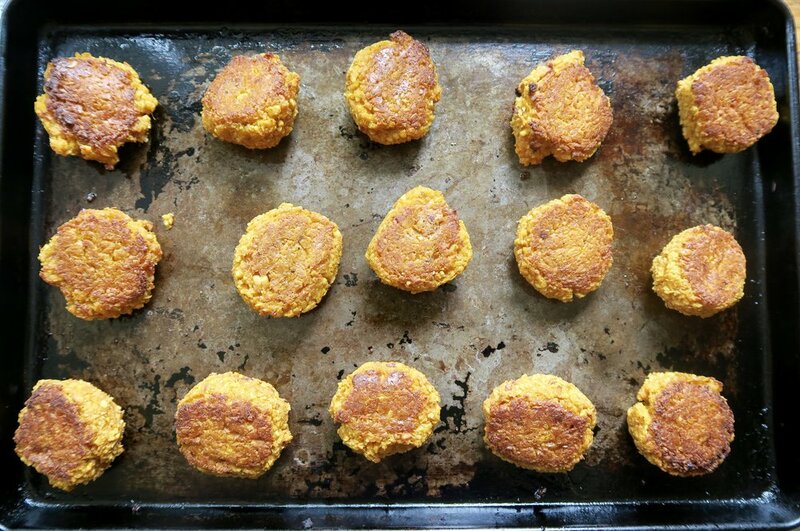 (side note: if you're cooking your chickpeas on the stove, you can put 2 pans of falafel in the oven at once). This is where I usually do some dishes or have a glass of wine and sit down for 15 minutes. Give your falafels a flip. They should have a nice golden crust on the bottom. If not, wait a few more minutes before flipping them over. They'll need another 15 minutes to finish up, then you can transfer them to a wire rack to cool. Add a little more oil and another batch of falafel balls to the sheet pan before it goes back in the oven for the exact same treatment (30 minutes, flipping halfway through). 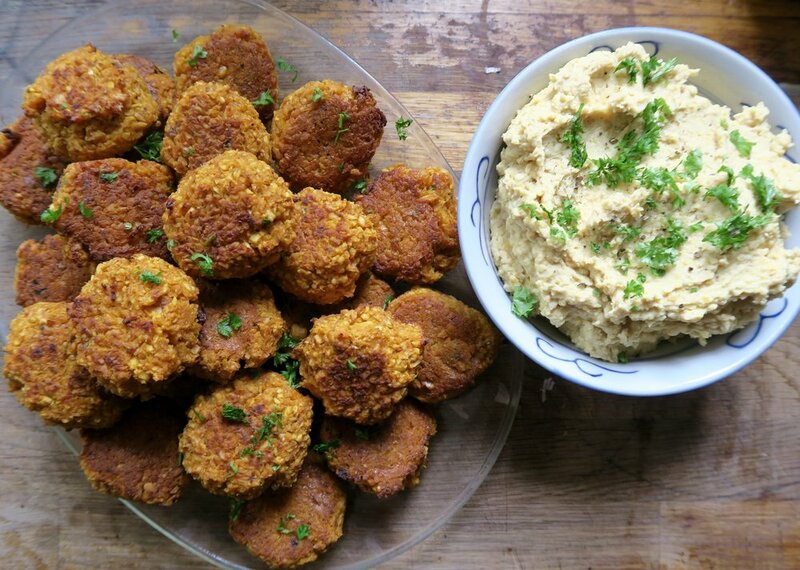 When the falafel are done, the chickpeas should be perfectly tender, which means it's HUMMUS TIME! Drain the cooked chickpeas, reserving about a cup of the cooking liquid. Add the chickpeas, tahini, garlic, lemon juice, salt and pepper, and 1/2 cup bean broth to the food processor and whizz up until blended. You'll need to stop and scrape down the sides periodically. If you find it's way too thick, add a little more cooking liquid. Taste for seasoning and adjust as needed. Decant into a bowl and sprinkle over some chopped parsley, which makes even the beige-est of beige food look delectable and fresh. Serve as a dip for veggies, alongside a salad, or spread on a sandwich. The falafel are perfect salad toppers, wrap fillers, or straight up snacks. They work beautifully together as part of a mezze spread with olives and roasted peppers and cucumber salad...the possibilities are endless, people!